For a company as secretive as Apple, one of the few ways you can learn anything about what it has planned next is to see who it has been hiring. High-profile hires say a lot about where Apple’s priorities are for the future. Looking back at the hires Apple has brought on over the last year reveals something pretty obvious: it’s assembling a wearables and fashion dream team. Chart via Matthew Phillips on Twitter. The above list of 17 hires collected by Morgan Stanley shows 9 positions related specifically to wearable or medical health fields. 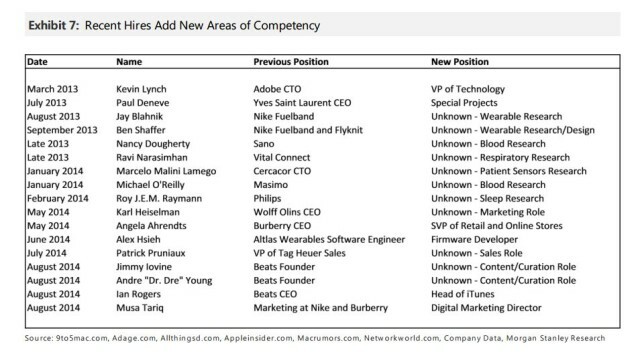 This obviously isn’t all of the hires Apple has made in recent months, but it paints a good picture of what Apple is interested in. Two key hires Apple made from Nike include Jay Blahnik and Ben Shaffer. Both men were key in the making of the FuelBand. It’s curious that Nike has ceased future development of the FuelBand with Apple’s wearable rumored to see the light of day in October. Just look at all the medical researchers Apple has brought on. Everything from sleep to blood research is being worked on, which will all be trackable in Apple’s new Health app in iOS. It’s widely believed that the sensor-laden iWatch (or whatever it’s called) will focus heavily on health and work closely with the HealthKit API to help keep track of important vitals. In the fashion realm, there’s the obvious choice of former Burberry CEO Angela Ahrendts to head up retail. Paul Deneve was hired from high-end luxury brand Yves Saint Laurent, and he now serves as Apple’s VP of “Special Projects.” Beats knows how to market a stylish wearable better than most companies, so it’s no surprise that Jimmy Iovine and Dr. Dre are Apple executives. 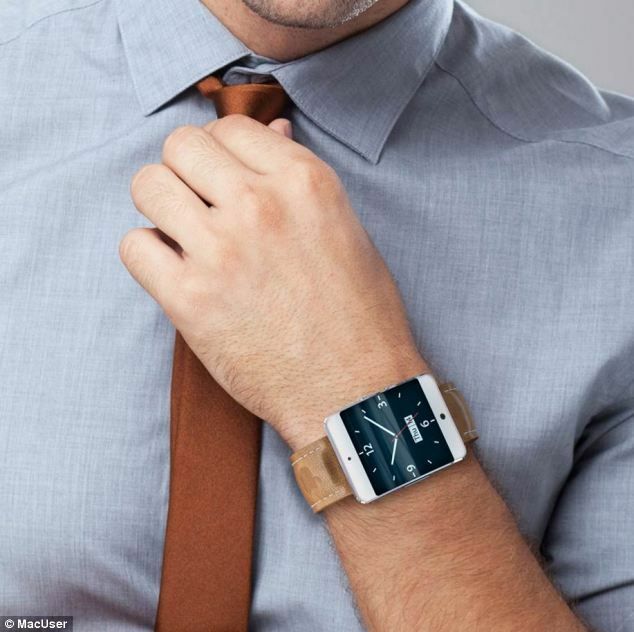 A report from last summer said that Apple was on an aggressive hiring spree for the iWatch after placing 100 engineers on the project. The company’s recent spike in R&D spending indicates that big products are in the works, and Apple has filed numerous wearable-related patents. Eddy Cue recently said that this fall’s product pipeline is the best he’s seen in his 25 years at the company.